The Philadelphia Wireman sculptures were found abandoned in an alley off Philadelphia’s South Street on trash night in the late 1970s. Their discovery in a rapidly-changing neighborhood undergoing extensive renovation, compounded with the failure of all attempts to locate the artist, suggests that the works may have been discarded after the maker’s death. 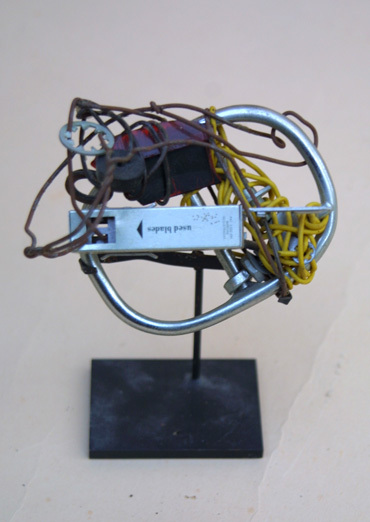 The entire collection totals approximately 1200 pieces and appears to be the creation of one male artist, due to the strength involved in manipulating often quite heavy-gauge wire into such tightly-wound nuggets. The dense construction of the work, despite a modest range of scale and materials, is singularly obsessive and disciplined in design: a wire armature or exoskeleton firmly binds a bricolage of found objects, including plastic, glass, food packaging, umbrella parts, tape, rubber, batteries, pens, leather, reflectors, nuts and bolts, nails, foil, coins, toys, watches, eyeglasses, tools, and jewelry. The totemic sculptures by Philadelphia Wireman have been discussed in the context of work created to fulfill the shamanistic needs of alternative religions in American culture. Curators, collectors, and critics have variously compared certain pieces to classical antiquity sculptures, Native American medicine bundles, African-American memory jugs, and African fetish objects. Reflecting the artist’s prolific and incredibly focused scavenging impulse, and despite — or perhaps enhanced by — their anonymity, these enigmatic objects function as urban artifacts and arbiters of power, though their origin and purpose is unknown. Philadelphia Wireman, whatever his identity, possessed an astonishing ability to isolate and communicate the concepts of power and energy through the selection and transformation of ordinary materials. Since 1992, this collection has come to be regarded as an important discovery in the field of self-taught and vernacular art.